Characteristics: affiliation, Original Series , Terran , Assassin, any Kirk, Human species, matching commander, romantic partner. 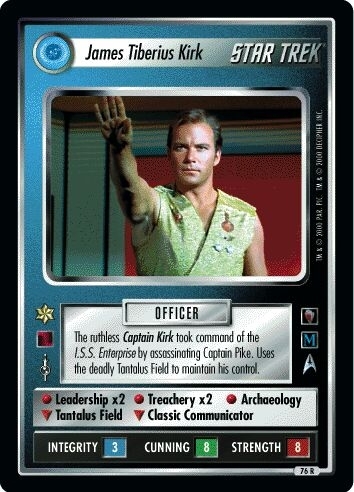 There are 33 entries for James Tiberius Kirk (ST1E 11 R+ 76) at the Tradeplace (25 haves and 13 wants). Click here to see all trade list entries for this Rare Plus card!